A first quarter moon hung in the evening sky that, by 2100, was too good to resist. I was able to set up in the last light of the day as, with the solstice only a few weeks away, it is getting dark very late now. After a quick star alignment with the 14″ auto-dob, I had the moon displaying on the increasingly frail laptop ready to capture some frames. 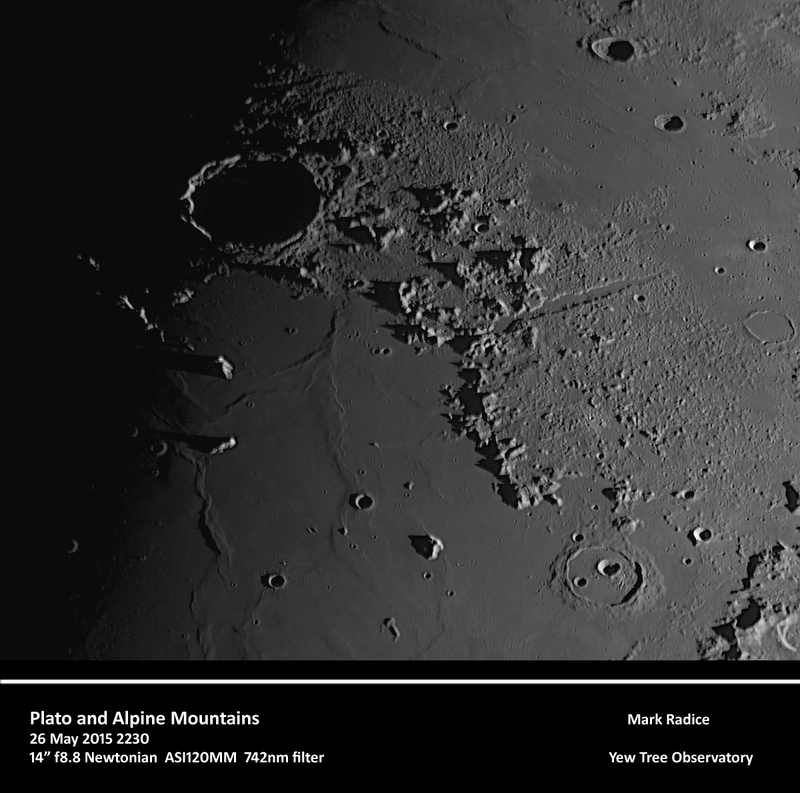 The Appenine region between Mare Imbrium and Mare Frigoris was stunning. I love the long dark shadows cast by Mons Pico and Mons Piton. There is a hint of a central crater on the top of Mons Piton as well. I wonder if this is an illusion or a genuine feature? 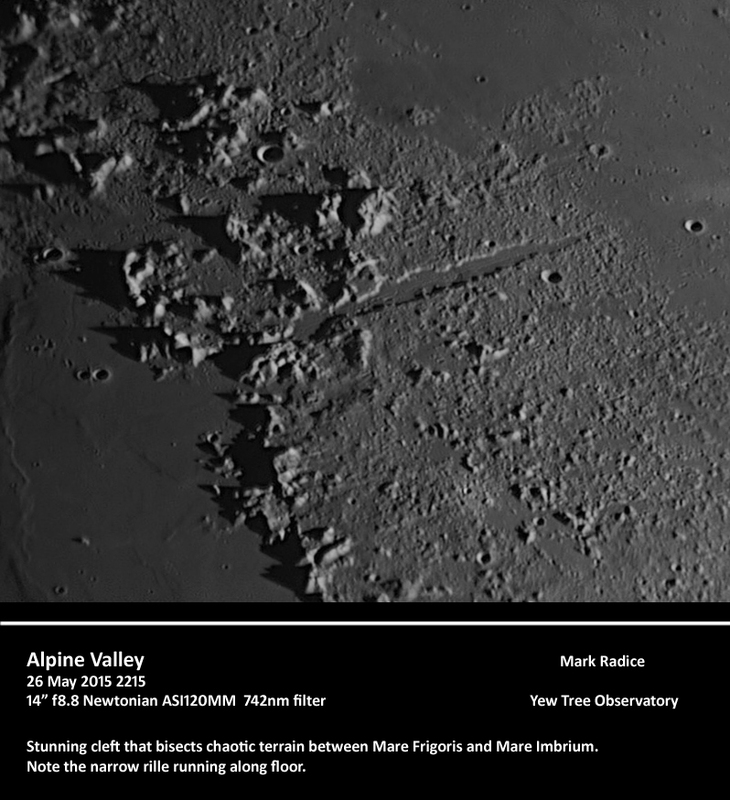 Note the 11km wide Alpine Valley, a rift in the mountains caused by the lunar crust pulling apart. The close up shows the thin shadow of a collapsed lava tube which varies from 0.55-1km down the centre of the Alpine Valley. 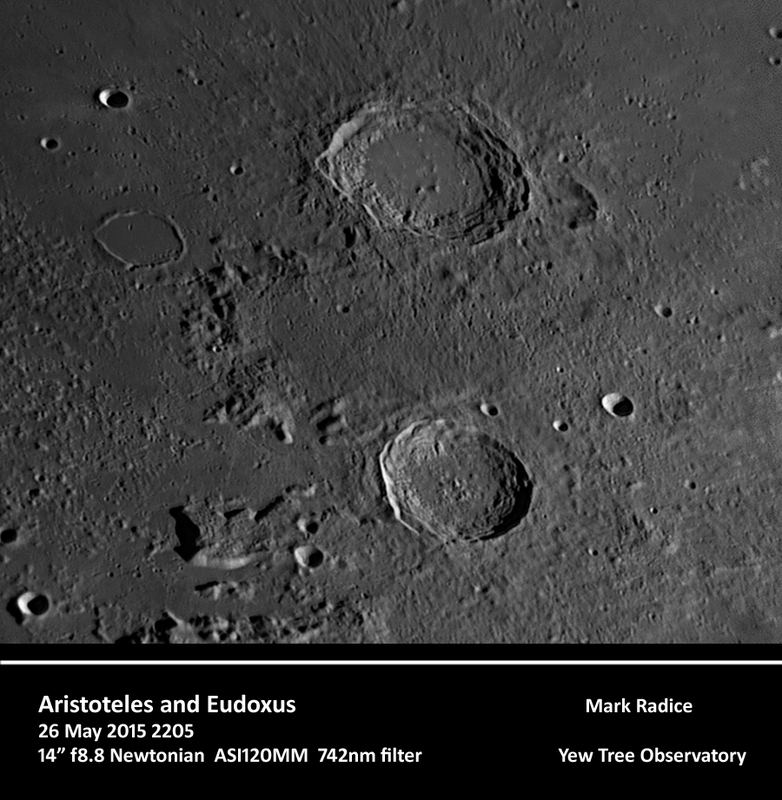 Adjacent to the Appenines are two large craters of dissimilar appearance: Aristoteles (87km) and Eudoxus (67km). 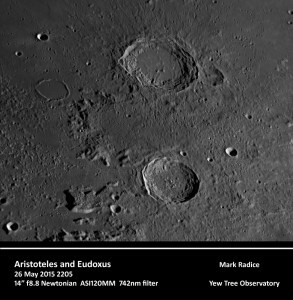 They both exhibit central remnants albeit Aristoteles’ floor is filled with lava. Both exhibit exquisite terracing on the interior walls and what appears to be a landslip on the western walls. 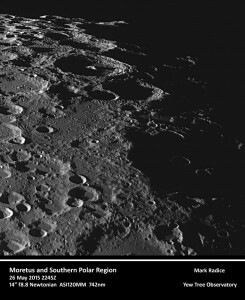 Here is an interesting view looking towards the lunar south pole. Somewhere up there are the Peaks of Eternal Sunshine, the proposed sight of a lunar base where the mountain tops are always in sunlight and there may be water ice in the permanent shadows in the crater floors. 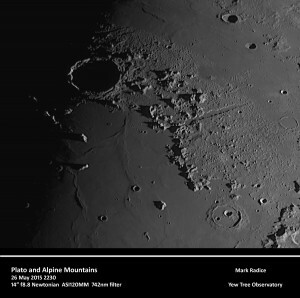 Moretus, the large crater in the centre is 114km in dia and the central peaks tower some 2km above the crater floor. I love the terracing around the crater walls. 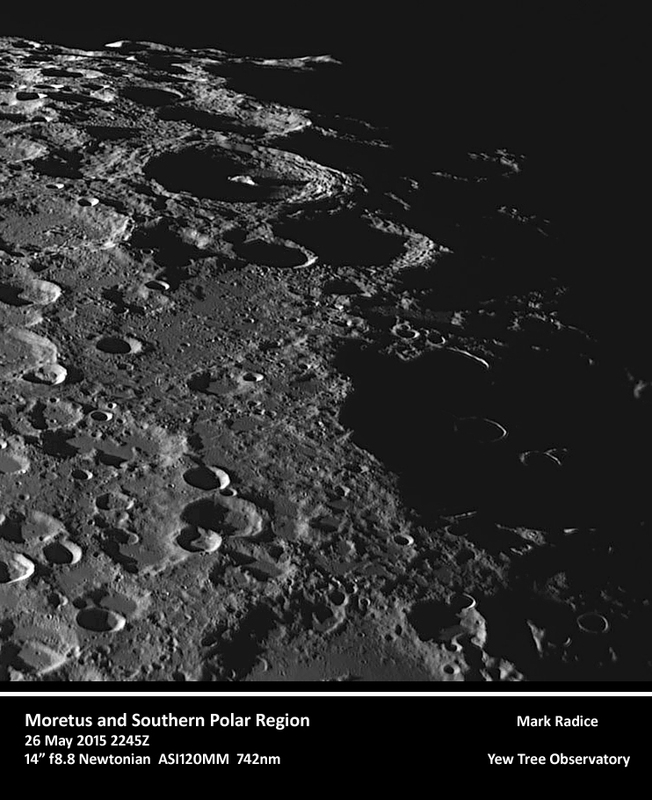 Note also the crater rims inside Clavius just catching the first rays of dawn. And to think I missed Britain’s Got Talent for this!